Has the Lord given you promises in the past that you’re not yet walking in? Has He spoken prophetic words over you that you haven’t seen come to manifestation yet? Has He promised you things that you really, really want–but you’re not seeing progress toward them in your life right now? It’s time to dig out your old prophecies and promises. Last night in my quiet time, the Lord spoke to me and told me to go dig out a list of promises He gave me many years ago from Isaiah 61 and 62. I dug out my old journal from that time period and found the list. It was from August 26, 2004, and He gave me 53 promises (personal prophetic words) that day out of these two chapters (Isaiah 61 and 62). And you know what? Out of those 53 prophecies–none of which I was experiencing in 2004–He has brought me into the manifestation of all but four of them, and I can see God moving in the four that I am not yet fully experiencing. It happened because, after He gave me those words, for YEARS I pored over Isaiah 61 and 62 and prayed those verses back to Him. For years I spoke those verses out as verbal declarations out of my mouth. For years I wept and meditated over those verses. But you know what? GOD didn’t forget. He remembered His Word, which shall not return to Him void. And He responded to my prayers and declarations. He watched over His Word to perform it. Partnership program update: I’m making a major life change to become a full-time missionary, but I need your help. So far, as of this posting, the Lord has brought me about 45 partners. If that’s you, THANK YOU! But I need several hundred more in order to begin focusing on this blog plus serving at my church’s prophetic/inner-healing ministry full-time. Please go here to see what’s in it for you, and sign up to be a monthly partner for only $8 a month. Lou Engle, founder of The Call, says: “Prophecy is not automatic. It is an invitation to become pregnant until birth.” When I heard him say that the first time, it hit me right between the eyes … because the Lord has given me many, many promises, prophecies, and prophetic dreams that I have tucked away in journals, but have otherwise forgotten about. Brothers and sisters, it’s time to dig out our old prophecies and promises. It’s time to become pregnant with them, praying them back to the Lord over and over until we see them manifest. It’s time to pray into our old dreams and visions. It’s time to steward the promises He has given us by lifting them back up to Him–giving Him no rest until He fully performs His Word. Over the next few weeks, I’m going to be digging out my old journals and reading through them again. I’m going to record my promises and the prophetic words He has given me in my journaling Bible, so I can keep them with me at all times. And I’m going to begin praying into them again. I’ve abandoned many prophetic words He has given me, and by doing so I have missed out. But I don’t want to do that anymore. I want to become pregnant with His promises until I see them ALL birthed in my life. If so, it’s not too late. Start now; start where you are. Start with what you have. Dig out your old notes or journals if you have them. If you don’t have any notes or journals, start with the promises you do have–the Scriptures that are particularly meaningful to you, the Scriptures that describe what you are desperate for Him to do in your life. Write those promises down in something you can keep with you at all times. Then lift those verses back up to Him in prayer. Meditate on them. Ponder them. Get a vision in your heart of how amazing it will be to walk in the vision and dreams God has given you for your life. Let yourself get pregnant with God’s prophecies and promises over you! Let yourself get pregnant with God’s dream for your life. Let it become reality in your heart, spirit, soul, and body. Let those prophetic words become real in your heart. Then intercede for your own destiny until you actually see ALL of those things birthed. Is the Lord speaking to you about praying into your old prophecies and promises? Does this word resonate with you today? If so, please leave a comment below. I’d love to hear from you! This is such a timely word. I, too, have wandered off in the cares of this world / busyness and gotten slack in confessing God’s Promises back to Him. I know to do it. I just get lazy and complacent through busyness. Thank you for this post. It’s jerked a knot in that laziness, and stirred me up. For me, it’s Isaiah 60, Psalm 91 and Matthew 6:33. I’m going to busy myself right now with writing, praying and meditating on the specific Promises He’s planted in my heart. I’m so glad Papa stirred you up, Dee. Arise and shine! 🙂 It’s time for many forgotten promises in the Kingdom to come to pass. I am praying for you today! Thank you! Such a timely word. I know it’s time to really believe the promises that God has given me and to see them come to pass. Of late I have felt discouraged, forsaken, and so on my own. Last night, as I was pondering my life, my destiny, and even Gods word, God placed these words in front of my eyes. “But you just hold on to what i told you!” That sent me on a search. What has God told me? Have I heard right? Were you talking to me when you spoke? Still doubting! The Holy Spirit had to remind me of my experience prophesying over someone’s life. What an experience. A wonderful experience. Today, Jamie, God sent you with Isaiah 61. To recall what He had spoken to me. The prophesy He has declared over my life. What He has already done. The reason why I am here. And that said, what He has already completed. It IS finished! Thank you for obeying God and your call. It is time to dig out old prophecies and promises. What a revelation and an inspiration. May God’s face continue to shine on you. Wow! That is too, too, too, too, too cool! Go, JESUS! I love Isaiah 61 so much. 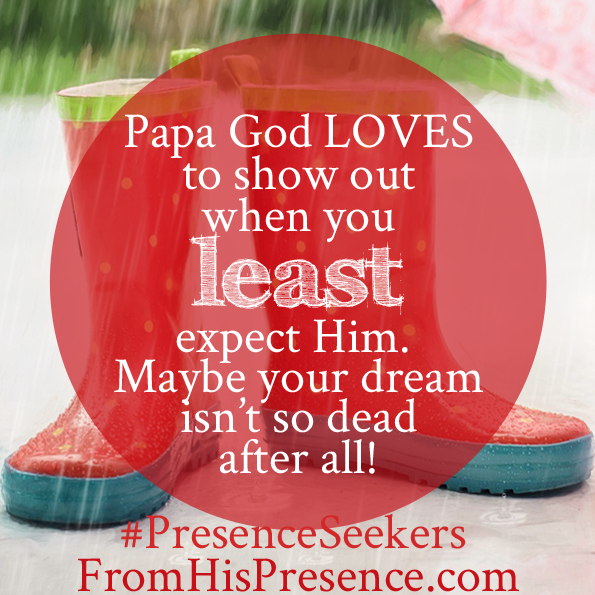 I pray Papa would bless you and renew your passion and determination to receive EVERYTHING He has for you! God is so amazing. Last two weeks ago my Apostle told the prayer group to write every prophet word that has been told to us. And for us to declare it over our lives. God is speaking. He is the same God all over the world. I have been claiming strong prophetic words that were given to me over the past year, but you have encouraged me to be even more bold and engrossed in speaking those words back to God. Unsurprisingly, since I’ve staring claiming these prophecies, the devil working hard to knock me flat…so I choose to simply claim those prophetic words even louder. But everyone can use some help in the prayer support department…and the devil’s tossed a nasty situation in the shape of a court case in my path at the moment, so if you could be so kind as to raise me up in prayer for overcoming this obstacle, I would be grateful. Hey Karen, yes! The righteous are as bold as a lion. 🙂 I totally identify with the warfare thing. I will pray for you to persevere and abide under His shadow so He can protect you! If you haven’t heard it, you might really be encouraged by this message I preached a couple weeks ago about how all hell struck me recently, and about how Papa will hide us under His wings. You can listen to it for free on the podcast here. 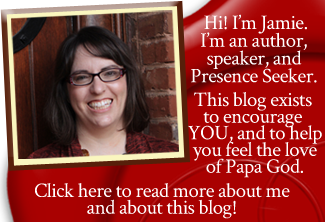 I pray Papa would bless and protect you today, and that the Holy Spirit would advocate for you amidst all your needs! 🙂 Have a wonderful day! Yes! Going thru notes right now. Seems like so much info. coming at us from different ministries But feeling assured He doesn’t miss a thing….I just have to do my part! Never gonna let, never gonna let me down! Sunday we asked what Holy Spirit wanted to be for us in this season…for me, birthing coach….it will be worth it because we are assured His love lasts forever…. P.S. have also been getting more rest…funny how much easier things seem when our focus narrows :)….still working on the three nights in a row of early sleep hopefully soon. Yes, sometimes it does seem like a lot, but even keeping the most precious prophetic words lifted up to Father will make a big difference. And praying for things that are essential but that we often forget to pray for… like our marriages and money and the seeds we have sown. But He will help us as we press into Him! Thank you so much for this article. I have a lot of promises (forgotten and some I could still remember). I think I have to remind God of all his promises and ask him to remind me of those forgotten promises. My location currently was by the prophesies of God but other prophesies that came with that hasn’t been fulfilled. Great ideas and write up in here. May God continue using you to inspire us. Thank you so much for reading, Joseph. I pray the Lord would continue to lead you and guide you into everything He has for you, showing you the steps He wants you to take even this day.